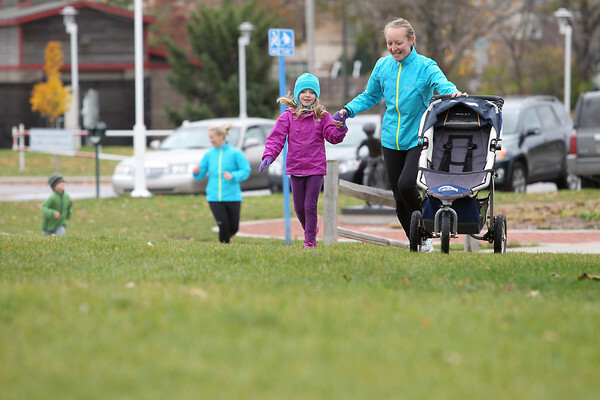 Jessie Bachmann (cq) and her daughter Ava (cq), 6, finish Saturday's The One Way 5k run/walk at Traverse City's Open Space. The run, was held in over 25 cities to support Traverse City native Michelle Antaya Grinsel, who is battling breast cancer in California. The runs were organzied by Grinsel's childhood friend, Jill Burden (cq) and a network of friends across the country, to raise approximately $8,000 for Pink Lotus Petals, a non-profit group raising funds for women in the Los Angeles area who cannot afford their treatment.